It has been a while since I posted about the clothing diet. (or anything else!) I did continue sewing over the summer and made a skirt from scratch but don’t have a photo. What is more interesting, I think is this top which was a skirt. Here is the skirt. 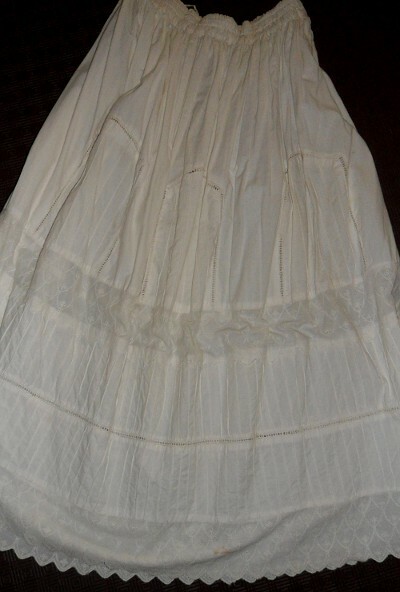 It is a white cotton skirt made from panels of different fabrics. Some panels are embroidered, others pin-tucked or lacy. It does seem a little stained in the picture but bleach and sunshine did a great job on that. I wanted to feature the embroidered panels in the top so I cut my pieces from the bottom of the skirt making the scalloped hem the hem of the new top. There was enough of the pin-tucked section to cut both sleeves from it too. I made it in summer, photographed it in fall and finally got around to posting just before winter. This entry was posted in Clothing Diet, Hand made on December 13, 2010 by Heather. My next sewing project was a dress from a piece of fabric I have had for quite a while. My plan was to wear it for the girl’s final Stellae Boreales concert but as I started it the day before, it was never a realistic expectation. They were guest performers at a fundraiser the following week so I wore it there. As usual when I make something, I adapted the pattern. There is generally something that isn’t quite what I want so I have to work out the way to adjust and the order to put it together. That being so I was happy with the outcome. I know my mother won’t be happy that my head is cut off in this shot but I have been waiting to publish this post and the only thing holding me back was the lack of a good picture. Rather than wait for a good picture of me I decided to just chop my head off and proceed. This entry was posted in Clothing Diet, Hand made on August 1, 2010 by Heather. The first thing I made from scratch this year was a blouse. I was shopping with A13 for a birthday gift for one of her friends. The shop where we were does not usually have much which appeals to me. This time however I saw a bunch of blouses and tops in styles I really liked. After studying them I came home and designed a similar one myself. I had the perfect piece of white linen/cotton fabric already and only had to buy buttons to finish it. 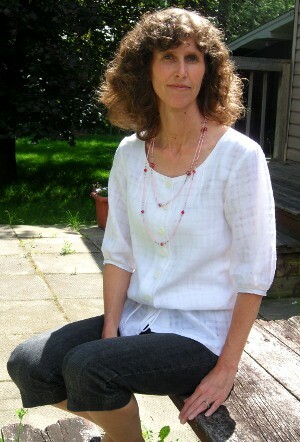 This entry was posted in Clothing Diet, Hand made on July 6, 2010 by Heather. I have a project going this year which, although the year is already half gone, I will finally write about. I decided early on in the year that I wouldn’t buy any new clothes this year. Instead I would make do, make over or make from scratch. Like many women I have plenty of clothes in my closet and only a fraction of them get worn on a regular basis. There are some I can get rid of but others I like too much only they either don’t fit or don’t suit my current state of mind! I was mentioning to the children recently that I would need new runners soon and B9 exclaimed, “But aren’t you on a clothing diet?” His words not mine, but it describes the general idea so that is what I’m calling it. Shoes, by the way are not part of the diet, I cannot make shoes. I have done this once before. In 1989 I spent the year at Theological college doing a 1 year Diploma of Bible & Missions. I had worked for two years and saved in order to study that year and decided not to spend any money on clothes from January to December. I did not know when I began that before the end of the year I would be preparing for my wedding. I stuck to my commitment regardless and made my own wedding dress, something which I had always planned to do anyway. So far this year I have turned one dress into a skirt. The dress was one I bought in Melbourne while shopping with my dear friend Alexandra. She convinced me to step out of my comfort zone and buy a green dress, a change from the blue I usually wore. I bought it from Monsoon, which was for a long time my favourite clothing store. Fortunately they had very impressive sales twice a year otherwise I could never have bought anything there. I realized too late that I should have taken a “before” shot, so I could post it beside the after. L15 was not impressed when she saw that I planned to cut up the dress, she thought it was much prettier the way it was. She was probably right but I felt I would wear it more as a skirt and it would fit me better. Just after I converted it I was given a “hand me down” blouse which matches beautifully. Hand me downs are totally acceptable in this diet, in fact they are encouraged. There are two sides to this challenge of course, one is making or remaking what I want or need. The other is not buying; the best way to not buy is to not shop, but I do see things when I am out shopping for the girls. I saw a pink sweater one day for $20. It was calling my name, despite the fact that I have two in that colour. They have zips, but this one was a pullover, an important distinction. I walked away. Harder was the day I saw a swimsuit. I will need a swimsuit very soon and the one I saw was precisely the style I like, exactly the colour I wanted, and on sale. It was however, not my size. This entry was posted in Clothing Diet, Hand made on July 1, 2010 by Heather.